Get the sleep you need consistently in a deluxe queen-sized bed � the O2 Queen Bed from Moe's Home Collection. This luxurious bed offers the perfect mix of retro and modern styles, making it a great choice for those who are looking for something different to complement their bedroom's d�cor. 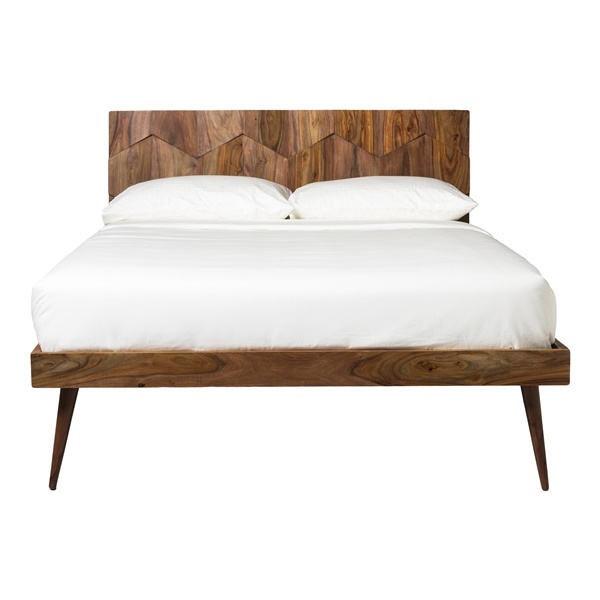 The bed also consists of beautiful sheesham wood, giving the piece a natural appearance that will maintain its quality for years. Enjoy a stunning bed that is both comfortable and stylish with the O2 Queen Bed. Built from solid sheesham and MDF that gives the bed a dazzling appearance. Exceptional construction guarantees the bed is built to last. Elegant, luxurious design makes the bed a great addition in both modern or retro bedrooms. Unique style enables the bed to make a bold statement day after day. What is the height from the floor to the bottom of the siderails? Also, what is the height from the floor to the top of the slats? The underbed clearance (height from floor to underside of the siderails, is 12.9 inches. The height from the floor to the top of the slats is about 17 inches.